Usually lazy accidents like this happen on the last day of work for the week. It's the French. They'd aim for Notre Dame and hit the Arc de Triomphe. The irony of you telling Flaggy to stop. Stop it- a world icon has burned down. Thanks keep for the map link. And Joe, I only have BBC in SD but was able to catch a few minutes. But, the Beeb says that the know that they were able to save the walls for now, which is great news considering the support timbers were stabilized by the famous roof design. Also, theres just something about learning to just shut up and let the news show itself like the BBC did that we could use in our media. Less talking heads talking for the sake of talking. This does give some optimism that it can be rebuilt. I would not call it restored. And seeing how long other churches have taken to be built, unless multiple billions are raised, this is going to take decades to rebuild. No one's going to complain about introducing politics and racism into a thread about a tragedy? Guess that only applies to sports. I'm watching the live news feed from France 24 and I've rarely heard so much grief and sadness in the reporter's voices. They usually suppress those emotions but not tonight. Do you blame them for being sad? Notre Dame is, by street coordination, the center of the city. 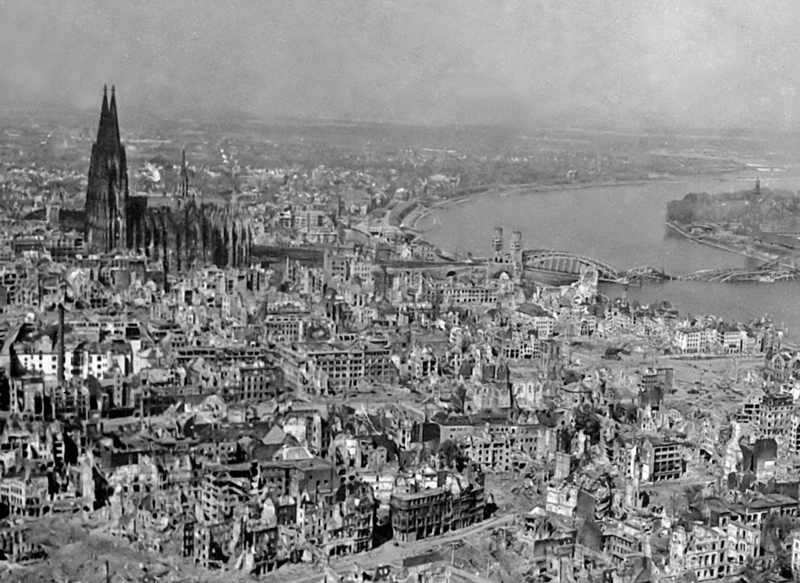 The cathedral suffered fourteen hits by aerial bombs during World War II. Badly damaged, it nevertheless remained standing in an otherwise completely flattened city. The twin spires were an easily recognizable navigational landmark for Allied aircraft bombing. On March 6, 1945, an area West of the cathedral (Marzellenstrasse/Trankgasse) was the site of intense tank combat between American tanks of the 3rd Armored Division and a Panther Ausf. A of Panzer brigade 106 Feldherrnhalle. The Panther successfully knocked out a Sherman killing three men before it was destroyed by a T26E3 Pershing hours later. Footage of that battle survives. The destroyed Panther was later put on display at the base of the cathedral for the remainder of the war in Europe. Repairs were completed in 1956. No, I don't blame them. I think it's a commentary on how sad this is and a tremendous loss for the French people.